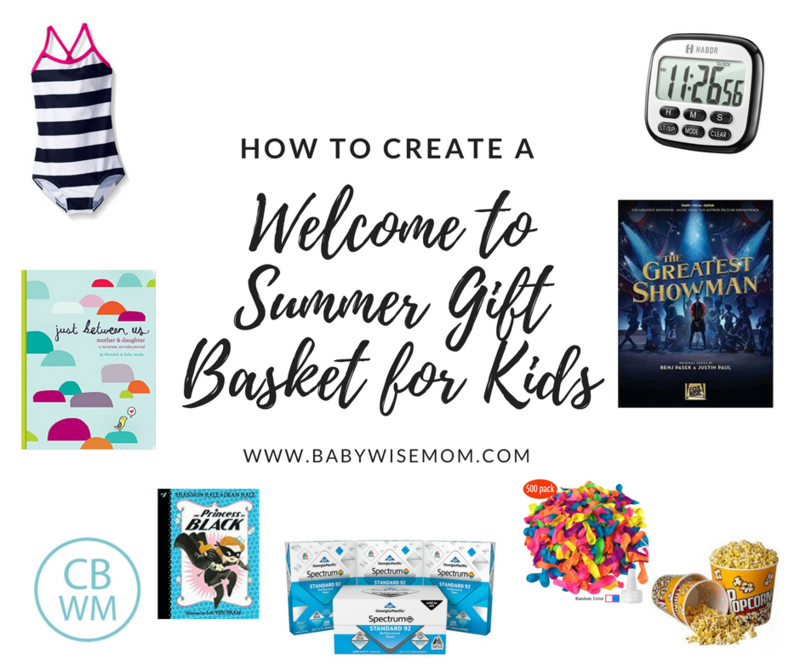 What to Put in a Welcome to Summer Gift Basket for Your Kids. 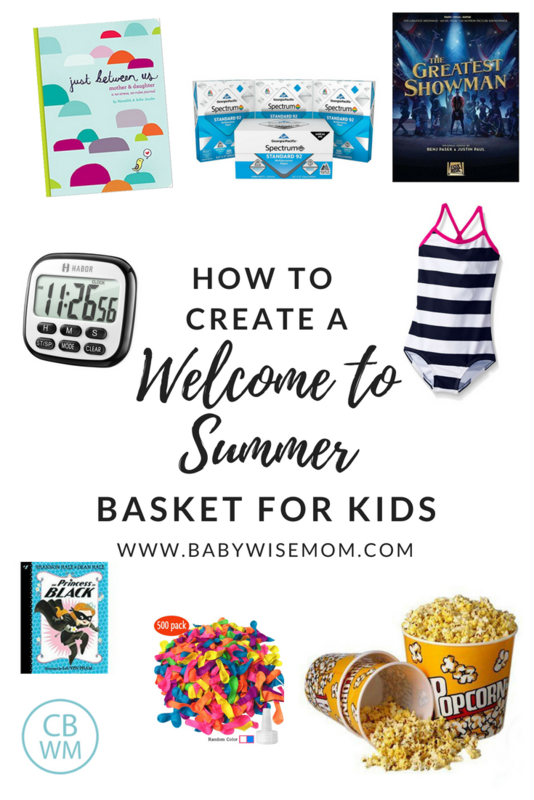 Great items to give your kids to kick off summer. 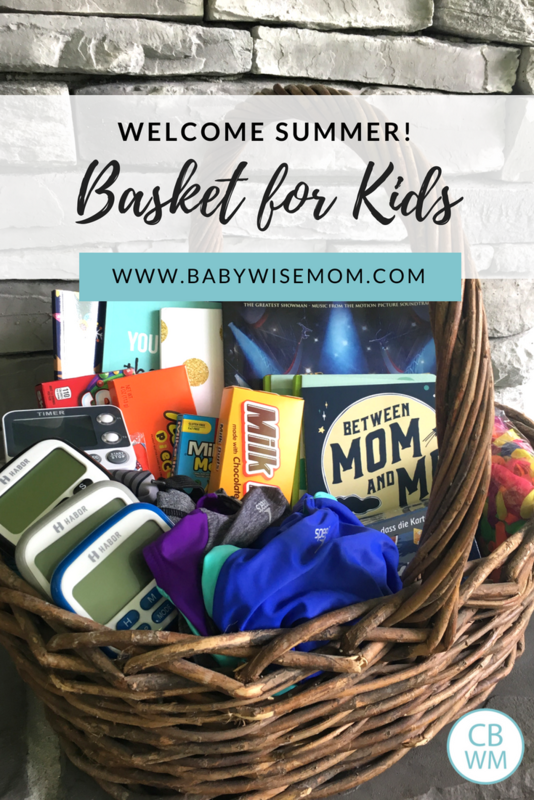 I am not sure what has come over me, but this summer I decided to do a “welcome to summer” gift basket for my kids (shhh…they don’t know yet). I guess it all stemmed from my decision to start tracking video game time for the week on timers. One mom mentioned she does this in the Chronicles of a Babywise Mom Facebook Group and I loved it! I thought it would be a good idea to balance these timers, which aren’t that exciting, with some exciting things for summer. Here are my items so far. I still have a couple of weeks before they are home for the summer, so if you have a great idea to send my way, let me know! I started with a list of things we want to do this summer, then created a basic schedule, and thought about what I need to purchase for our upcoming summer months. There are things I would get anyway, so putting them all in a basket and presenting it as a gift adds a lot of excitement. This post contains affiliate links. This is the item that inspired this whole idea of a basket. I bought these timers on Amazon to use to keep a running total of how much video game time has been played. The kids currently track their own time, but it is often a “Um…I have about an hour left.” We do three hours a week, so I made sure to get timers that do more than 90 minutes. I got a different color for each child. The main timer that I got came in three colors, so I got three of those plus this style of timer. All of my kids play the piano. It is fun to have a book of fun piano songs to play, and they are all obsessed with the Greatest Showman, so I got them a Greatest Showman piano book. It will be above the levels of Brinley and McKenna, but McKenna can pick out at least the melody and Brinley can copy the melody from the other kids. Even if only Brayden plays, the girls will have a grand time singing along, so it will be a big hit. I really wanted this book to be to all of the kids so that no one could try to pull a “Don’t play from my book” moment. I don’t allow those type of statements, but I just anticipate this being popular enough that I wanted to make my life easier on myself. A ream of paper people. That is all it takes for pure joy. My girls all spend a lot of time drawing, so they go through a lot of paper. I love giving a ream of paper as a gift. Go crazy kids! We spend a lot of time at the library in the summer, so I debated about getting a book, but I want each kid to have their own, new book to read that they are excited about. We will hit the library every week, but my kids love owning their own books and they will read books over and over again. There are so many outdoor toys you could get. Water balloons, chalk, bubbles, squirt guns, balls, sprinklers, bikes, roller blades, etc. We already own a lot of great outside toys (see my post on our favorite outside toys here). One thing we were out of is water balloons, so I got a big pack of those. If your child needs a new beach towel, swimsuit cover up, suit, or even sunscreen, you can add it in. I am doing a shopping voucher for my older two; they are old enough they have opinions and tastes different than my own so I want them to have a say. This is pretty self-explanatory. Treats. You could plan some fun summer treats, like homemade Popsicles and include ingredients for that treat, or just some favorite treats. We like to do outdoor movies, so some popcorn and a new movie to watch this summer is fun. If you plan to go to a baseball game, the zoo, mini-golfing, etc., you can purchase the passes or tickets ahead of time to include in the basket. This gives you all time to look forward to the fun event. It also commits you to completing summer bucket list items you have for your family. You could also announce a vacation coming up with items for the vacation. As each summer approaches, I sit with each child and go over goals they have for the summer. I outline what skills I want them to learn. They can request things to learn. So I am having a child learn to clean mirrors properly this summer. I might buy some things to add in that help with mirror cleaning if we need it. Kaitlyn wants to learn to sew, so I could include something for her to go with this goal for the summer. Cookbooks, printouts, ingredients…Again, things you would already get, but you wrap it up in gift form.